Click the images above to reach the MartinLogan website. Started in the late 70's, Martin Logan was conceived by two Kansas engineers: Gayle Martin Sanders and Ron Logan Sutherland. Their aim was to produce a new generation of electrostatic speaker. …For anyone seeking the ultimate in sonic purity and clarity, electrostatics held enormous appeal. Unfortunately, designing and building one that will also produce the sound levels and bass extension most people expect from a loudspeaker is a formidable challenge, even today. Back then, only a relative handful of electrostatic speakers had ever been brought to market. Although most were failures, a few, such as the KLH Model 9 and Quad ESL, were legendary among audio enthusiasts. … the first prototype was ready in 1980. Naturally, it still had that science-project quality - a flat aluminium panel sprouting wires, struts, transformers, and power supplies, connected to an amplifier in Sanders' living room. It sounded even better than expected, but when they turned up the volume, a lightning storm erupted across the panel and music was replaced by a plume of smoke drifting toward the ceiling. Still, they knew they were close. Their first hybrid loudspeaker was created in 1983 and was dubbed The Monolith. It was a rather large unit incorporating the new curved (see-through) electrostatic panel and a 12” bass driver for low frequency duties. This new speaker was well received by hi-fi critics and music lovers alike and by 1986, a MK2 version was born. Their first full range electrostatic was dubbed The CLS. In 1987, we had the great fortune to listen to music through this marvellous loudspeaker at The London H-Fi Show and were blown away by its three dimensionality, clarity and above all, spaciousness. It was an experience that has stuck with us to this day. In the early 1990’s MartinLogan dipped its toes into the home theatre arena complete with a range of centre channel, wall mounted and subwoofer speakers which included the Aerius, SL3, Quest, and Cinema. In 1997, the aptly named Statement E2 was unveiled. A pair of twin panel electrostatics; one for mid/ bass and one for treble plus a pair of four box eight, count ‘em, eight 12” sub woofers in a dipolar arrangement. Each of the two main columns stood at nearly seven feet and the two subwoofer columns were close to six feet in height! That’s sixteen 12” woofers in total! If anyone had the balls (and the bank balance) to acquire these monsters and set them up in a semi-detached house: congratulations! You'd have the option of blowing your partition wall to kingdom come and turn two houses into one! Such was the power of these Goliath's and the cost of these potential home wreckers; a whopping $120,000! In 1999, MartinLogan unveiled the Scenario. This elegant full range (and relatively affordable) selling at approximately $2000) hybrid stands at just under four feet tall and ten inches in width with MartinLogan’s familiar curved ‘transparent’ electrostatic panel. …The Scenario will excite those who need to save space, without compromising performance. Enlist the Scenario for stunning stereo duty, or as a front or rear speaker for convincing cinema magic. The latest embodiment of exclusive MartinLogan ESL (electrostatic loudspeaker) technology projects an illusory world of sound with depth, pinpoint imaging, and our trademark clarity - all contained in one square foot of space. The multi award winning Prodigy descended from the Statement in 2000. This outstanding relatively compact performer includes technological advances such as ‘a new generation propriety CLS (curvilinear line source) electrostatic drive transducer and a revolutionary hybrid drive configuration and cabinet that eliminates room interaction and resonances.’ Another firm favourite with music lovers who have limited space but still crave high resolution performance. MartinLogan is a globally recognised company with a respected brand who have continued to explore, create and develop. 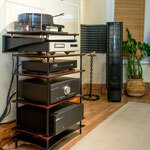 MartinLogan have a ‘world of sound’ on offer to those who appreciate and expect the best. Now firmly established as a loudspeaker 'technology' company (not just an 'electrostatic' company) MartinLogan ventured where few high-performance speaker companies dare to tread... inside of a wall. The Voyage and Passage in-wall loudspeakers (released 2004) challenged the entire audio industry by releasing in-wall speakers with true high-performance sound. Go back to Hi-Fi Experience Main Page.